There will be a Gallery Reception on Saturday, October 16, 2004 at 3:30 p.m. All are welcome. 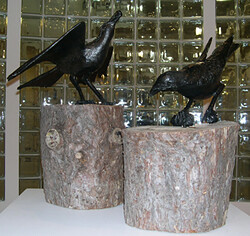 Luther Galleries is pleased to present the work of four alumni artists who work professionally in bronze. Many of their projects have been created as commissions, exist as parts of environmental installations, or are simply too large for a gallery exhibit of this kind. Photographs, drawings, models, or informational texts therefore represent original works unavailable for display. It is our hope that this exhibit will enable viewers will gain a greater appreciation for the nature of bronze casting in general, and the scope of alumni art work in particular. Dale Raddatz (LC '70) earned his MFA degree at Northern Illinois University in DeKalb in 1973. For the next several years he taught art at Elgin Community College (IL) and also worked as a studio artist. He returned to Luther in 1985, where he currently serves as associate professor of art. His professional work has included the design and construction of several pottery kilns and participation in numerous professional workshops, skills he has put to good use in the expansion of the sculpture facilities at Luther College. While at Luther he has served as chair of the art department, led several study-away programs for students, and in 1990-91 directed the Nottingham Study Abroad Program in England. In 1998, Raddatz received the Doris and Ragnvald Ylvisaker Endowment for Faculty Growth. His art has been included in numerous juried and one-person shows and can be found in several private and institutional collections. Recent commissions include a bronze memorial for the Children's Park at the Klehm Arboretum and Botanical Garden in Rockford, Illinois, and a bronze relief titled "Mission," located in the Shirley Baker Commons on the Luther campus. In 2003, he was one of three artists invited to serve as a Guest Artist for the International Stone Sculpture Symposium, in Uto, Japan. The large stone sculpture he created while there is now part of the Uto City Marina Sculpture Garden on the Island of Kushu, Japan. Chris Bennett (LC '74) has been working as a full-time sculptor since 1979. He attended Luther College before leaving to study with Mustafa Naguib at the Naguib School of Sculpture in Chicago. It was there that he received classical training in sculpting the human form, a critical element in much of his later work. 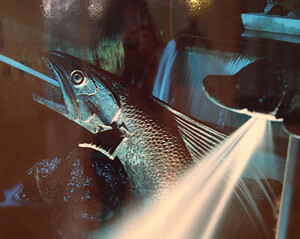 Additional study has been undertaken at both the University of Iowa and the University of Colorado. Bennett is a prolific artist with over 45 public commissions and numerous private commissions to his credit. They include a massive pair of 14' tall bronze hands in a landscaped outdoor chapel at Veterans Memorial Auditorium in Des Moines (IA). When it was completed in 1994, "A Veteran's Prayer for Eternal Peace" was the only public memorial to military chaplains in the United State. In addition to the numerous commissions, his work has been exhibited at the Hearst Center for the Arts in Cedar Falls (IA), and at the Loveland Sculpture Invitational in Loveland, Colorado on three occasions. He has served as an exchange artist to Kofu City, Japan, where he not only exhibited some of his pieces but also created a ceramic portrait of the mayor. He has been the recipient of numerous grants, among them several from the Iowa Arts Council, and in 1999 a grant from the prestigious Pollack-Krasner Foundation. Bennett's home and studio are located in Keosauqua, Iowa. . In addition to his work in bronze, Bennett also creates in ceramic, worked steel, wood, stone, resin, cast iron, plaster, and cement. 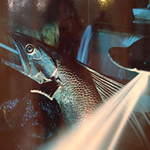 Additional information, and other examples of his work, can be seen on his website. Following Douglas Freeman's (LC '75) graduation from Luther, he continued his formal art education with graduate study at the Naguib School of Sculpture in Chicago(1975-77). During that time he served as primary assistant to master sculptor Mustafa Naguib. His formal art training has been supplemented by several workshops and periods of extended study with a variety of professional artists, among them Toshio Odate, Tony Hepburn, and Marguerite Wildenhain. He has also spent extensive periods of time engaged in concentrated study and research in Italy, Nepal, and Thailand. Freeman's primary focus has been the creation of commissioned public sculptures that have developed over the years from an emphasis on individual pieces to environments that integrate sculptural elements and landscape design. He recently completed a sculptural commission for the Mayo Clinic in Rochester (MN), and is currently working on a project in conjunction with LRM landscape architects to develop a new urban center with fountain and performance space in Culver City, California. Other works in progress include a plan for a new Central Park with fountain, performance space and a memorial in Charles City, Iowa; and the creation of a new Fire Service Memorial on the Minnesota State Capitol Mall in St. Paul. 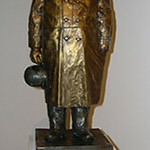 Countless visitors to the Minneapolis-St. Paul International Airport have seen his 1987 Minnesota Fire Service Memorial that depicts a firefighter descending a ladder with a child in his arms. In 1995-96 he completed work on 14 bronze sculptures for the neighborhood of Akabane, Tokyo, Japan. 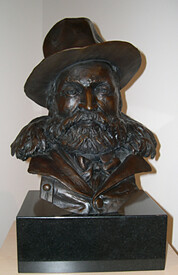 An early work, a bronze portrait bust of "Pip" Qualley, is located in Qualley Lounge in the Center for Faith and Life on the Luther campus. Mike Knudson (LC '76) graduated from Lutheran Theological Seminary in 1981 and currently serves as Senior Pastor at Trinity Lutheran Church in Omaha, Nebraska. His art degree from Luther College has been supplemented with additional study in sculpture at Bellevue University (1989-90) and Creighton University (1991-92). He has over 18 sculpture commissions to his credit, including many that reflect religious themes or otherwise explore intersections of art and faith. In 2003, he received a Lily Endowment Vocations grant from Luther College to work in residency during dedication activities for the new Center for the Arts. During that time, he created a bronze portrait bust of Orville Running, first modeling the form in clay from sittings conducted in the building's main foyer. 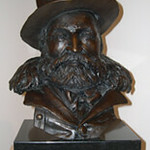 The finished bust can normally be seen in the second floor foyer above the main entry to the building. He is currently working on a commission in conjunction with the upcoming retirement of Weston Nobel. Knudson has exhibited his sculptures in several Omaha galleries, but his art experiences have embraced more than sculpture. He has been a cartoonist for the Nebraska Lutheran magazine and for the national publication, The Lutheran. He worked for a time as a commercial artist developing promotional materials for KPTM television in Omaha, and he has also completed needlepoint design commissions. 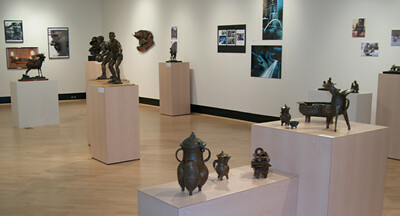 The bronze foundry at Luther College is quite unique for institutions of this size, and its development reflects transformations in the sculpture program within the art department. Sculpture was first taught at Luther College in the middle 1960’s when the art department was located in Loyalty Hall, where sculpture courses shared space with the pottery studio. For several years courses were offered sporadically with a concentration in clay modeling. Dean Schwarz taught introductory sculpture courses and John Whelan taught a few additional figure-modeling courses. In the late 1980’s the art department began to regularize sculpture offerings by initiating courses that emphasized different mediums of exploration. Instruction was provided by Dale Raddatz, who built a small 45 lb. crucible furnace that allowed students to experience bronze casting, clay and wax modeling, glass slumping, plaster build up, wire fabrication and mold making. In the mid 1990’s, bronze casting facilities were expanded into a true foundry by the addition of a large burn out car kiln and a 270 lb. crucible furnace, both built on site by Luther students under the supervision of Raddatz. The new capacity of the kiln and crucible greatly increased the scale of possible casting projects and allowed the art department to offer an additional course in bronze casting. The current Center for the Arts, dedicated in April 2003, included a sculpture studio in its original design. As work on the facility progressed it was determined that it would be more cost effective to relocate sculpture into the former Storre Theatre building. That move created additional sculpture classroom space and also expanded the area used for bronze casting. 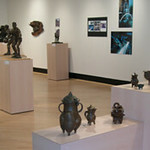 The renovated sculpture studio will be dedicated and open for inspection during Homecoming 2004. Luther College and the art department are proud to be among the few private colleges in the Midwest to offer such a facility to our students.